He was in the batting cage taking swings and he was in the outfield shagging flies. He was joking around and smiling and looked a bit trimmer, even if he said he actually reduced his offseason workload. Blue Jays center fielder Vernon Wells arrived to camp. Over the past few years, Wells has been a clubhouse leader — there is no question about that. But, he even admitted on Wednesday that he felt like the team was only “partly” his because Halladay obviously filled the leadership role. Now, as Wells arrives in camp as the longest-tenured Jay, things are different. Since we’ve been down here, it’s been clear that Aaron Hill has been ready and willing to step up as a leader for this young group. Manager Cito Gaston said Hill is willing to be vocal, if needed, and he’s even had the younger guys in full uniform before it’s required. That, and Hill’s comments to the media have already shown his feelings on this group. “I hope these guys know what kind of opportunity they have,” Hill told me on Thursday. “If I’m seeing it, I just hope that they see it. I love seeing guys really get after it and fight for it. I hate seeing young guys, or anybody, that just expects to be given something. You should always work for whatever it is — not just baseball. Asked whether he or Hill were going to be the team’s leader, Wells smiled. The reality is that there is plenty of room for both Wells and Hill to become veteran voices in the room for the Jays, and that is a great thing for the ballclub. With so many young players, Toronto needs some guys to fill the lead-by-example void created by Doc’s departure. On his wrist problems: “The real pain didn’t really come until about three weeks in the offseason. Once the cortisone shots and the anti-inflammatories were out of my system, it hurt to turn a wheel. So I said, ‘I should probably get this looked at again. They went in and looked at it and said, ‘Let’s get it cleaned out.’ I saw the before and after images and it was pretty neat. I got to see the inside of my wrist and it looks normal again. Which player is wearing these custom-made shoes? BIRD FEED: That picture right there is the precise moment when Gaston approached Adam Lind to discuss where the young designated hitter will hit in the batting order this season. Gaston has decided to keep Lind in the No. 3 spot. As the manager told reporters, he told Lind, “Why mess with it?” Gaston also talked to Hill about keeping the second baseman in the No. 2 hole for 2010. Gaston said, “Hill is a great kid. He said, ‘I’ll hit anywhere, even sixth if you want.” … Gaston said he will not play Wells or third baseman Edwin Encarnacion in a game until he is absolutely certain that are 100-percent recovered from the wrist surgeries they had over the winter. … Anthopoulos has been in the Dominican Republic this week scouting different players. The Jays watched Cuban first baseman Jose Julio Ruiz workout and the free agent is expected to make a decision about where to sign in the coming days. … Pitchers threw bullpen sessions on Wednesday and Gaston was impressed with what he saw from righty Dustin McGowan, who hasn’t pitched in a game since July 2008 due to health woes. If McGowan proves to be a legit contender for the rotation? “That’d be a great, great surprise for us,” Gaston said. … Gaston noted that Randy Ruiz (not in camp yet) and Brian Dopirak were definitely in the mix for a 1B/DH role with the Jays. If one made the team, they could be used as a DH on days when Lind played left field or at first base if Lyle Overbay needed a day off. Gaston said Ruiz and Dopirak’s chances of making the team would drastically improve if the Jays felt outfielder Travis Snider needed more time in the Minors to open the year. That would necessitate moving Lind back to LF regularly. 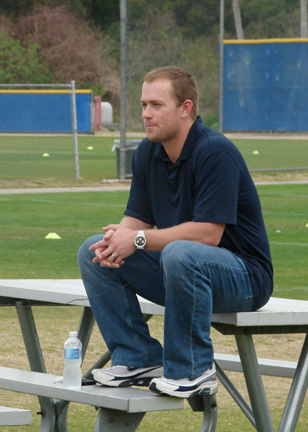 … Gaston noted that Toronto will most likely open the year with 12 pitchers and 13 position players, which has become the common breakdown for MLB clubs these days. 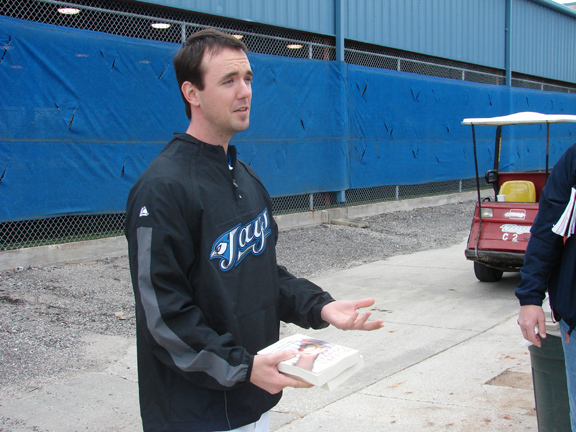 GARFOOSE SIGHTING: Blue Jays reliever Dirk Hayhurst, who has been banished to the disabled list with a bum right shoulder, emerged from the training room and showed off his upcoming book to reporters today. “The Bullpen Gospels” hits book stores on March 30 and is definitely worth a read. I read it over the offseason and enjoyed it. I wouldn’t keep mentioning it if I thought it wasn’t good. I swear. ANSWER: The shoes belong to none other than Adam Lind. He said they were made for him for the All-Star Game, which he had a chance to attend last year as a Final Vote candidate. Lind did not wind up winning the vote, but he received the cool kicks anyway. Do you really think Snider might end up in AAA to start the year? What would you put the chances at? Hey I really like your blog. Check out mine. I can’t believe you only have 2 comments on this post. If you read the Toronto Star and Globe + Mail, and/or all the blogs like Bluebird Banter, Tao Of Stieb, and the Drunks, everyone is using your spring training stuff. Come on Jays fans, show some love to MLBastian, and lend some posts to this site. It’s the place to be for the preseason. Thanks for the updates, I’m here daily. I think the Jays are on the right track. Bastian, important question for you. You said you read Hayhurst’s book “The Bullpen Gospels”, but have you read the classic book by Dave Stieb “Tomorrow I’ll be Perfect”. I have a beauty paperback copy that sits right on top of my toilet. I really just don’t understand how Cito Gaston is still a manager at the major league level. It’s almost not even considered that Bautista could be a bench player (which he should be) and Randy Ruiz takes a seat for HIM? The only way Dopirak or Ruiz get at bats is if Snider starts the year in AAA, where he has absolutely no place being? How long before he starts talking about wanting AA to trade with the Cubs for Kevin Millar? I know this year doesn’t mean anything, but it would be nice to see a shot given to Ruiz or Dopirak instead of unquestioned lead off privileges given to a bench player. Ok before we all go anti-Cito like some other blogs out there right now lets sit back and think about this for a second. 1. What is the goal of the Blue Jays for 2010? Its to continue to develop some young players to build a core around for the future. What do Jose Bautista, Randy Ruiz and Brian Dopirak have to do with this process? Nothing, right? so does it really matter if Bautista is getting bats over Randy Ruiz or Brian Dopirak? no… Cito has been given a sub par lineup to work with, and there are only 3 players right now I can think of that will be here when (if) the team is back to contention say 3 or 4 years down the line. Adam Lind, Aaron Hill, and Travis Snider (Wells too but lets not talk about him right now). Also there are many young pitchers they have to look out for. So for a sucessfull season in my eyes, and for Cito to do a good job this year, we will see Lind, Hill, and eventually Snider all hitting in a productive situation. He must also provide the best defence possible for those young pitchers to work in. That is where Jose Bautista comes in. His defence is right feild last year was very good. He may not be a “leadoff hitter” but really what else does Cito have to work with? Cito is here to teach the young players about winning and being a Major League baseball player, and I think he will do a fine job with that. Lind and Hill both have had career seasons playing for him, im excited to see what he can do with some of the other players. Wells a leader? I guess that is why he SHOWED UP EARLY to camp like some of the others, NOT! At 20+ million a year, Bastian needs to start asking Wells the hard questions. I think it’s great that Hill is willing to step up and lead this group of youngsters. I especially like his comment about not wanting to see anyone taking anything for granted. I think that’s extremely important with a young team and players like Snider who got caught up with the whole thing last year leading him into a slump. Also, I really don’t care for all the Wells hate. Is it Wells’ fault for accepting a contract he was offered? If you’re going to throw some hate, throw it at JP for that ridiculous contract. That said, Wells didn’t have a great season last year and definitely needs to improve his numbers this year. I’m sure Wells is going to be a leader but I’m not convinced it’s going to be “his team”. I’m more inclined to think it’ll be Hill’s team. It’s easy for Wells to talk the talk, but let’s see if he walks the walk. So far, in his first test he isn’t. I agree with Burt, Wells should have shown up a couple of weeks ago like Hill, Lind and others. There really is no excuse for him showing up one or two days before the mandatory reporting day-not if he is expecting to be a leader. My take is Hill will become the leader, not Wells, and there is no way in hell this team is ever Well’s team. Well’s ego just always gets in his way. As much as the success of the Jays this year depends on the whether or not Hill and Lind can perform to the same level they did last year, so much of it rides on Wells’ shoulders. He obviously won’t put up numbers close to his contract year, but if he can at least be effective and drive-in runs from the heart of the order, it will be a huge boost for the offence. If he is injury troubled and struggles to drive-in clutch runs again, it could be a long season. Hill and Lind should produce numbers that are somewhat close to last year, and if Wells can get his **** together it will go a long way towards winning a few more games than expected. I’m not saying if Wells, Hill and Lind all are hitting well we have a playoff shot, but could be the difference between a mediocre season and a big dissapointment. Maybe this season means nothing to some people, but personally, I want to see the Jays at least try to put out the most competitive team possible. Saying “it doesn’t matter” doesn’t cut it for me. Randy Ruiz lost some weight, and apparently he is an option for the OF. Overbay is a better option for leadoff in my opinion, I strongly believe he will bounce back in a contract year and revert closer to his 2006 numbers. Cito already wants Wells hitting cleanup, fine, whatever. But I think Ruiz deserves a shot in the 5 hole, you never know where you’ll find a late bloomer, and I don’t know what else he had to do both last season and in winterball. I can’t support a manager that literally turns our team into a one line joke after seriously batting Kevin Millar in the cleanup spot, or starting him at 3rd. He seems to have absolutely no clue what being a clean up hitter should entail.